Scooper - Technology News: Which are the world's most expensive cities? 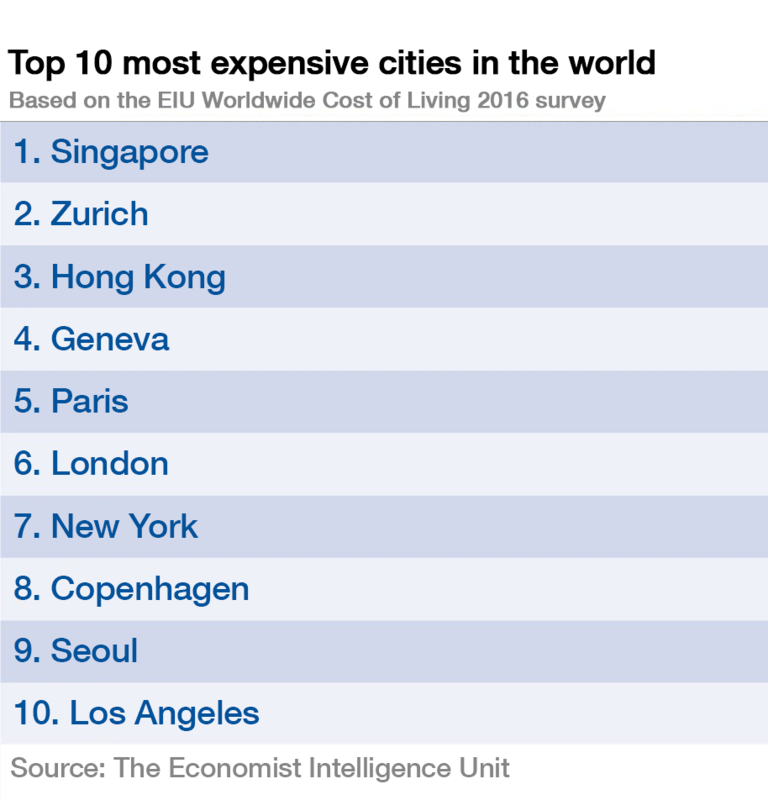 Which are the world's most expensive cities? Singapore tops the list as the most expensive city for the third time in a row, but in a year when costs around the world have been highly volatile . The Economist Intelligence Unit (EIU) produced its Worldwide Cost of Living 2016 report , ranking countries based on the cost of various products and services. Two United States cities have seen significant increases in costs, with Los Angeles rising 19 places to enter the top 10. New York City, now ranked seventh, has gone up 15 places since last year. It has seen a big jump in costs over recent years, moving up 42 spots since 2011. Japanese cities have seen a lowering of costs, despite being some of the most expensive cities over the past 20 years, Tokyo and Osaka have dropped to 11th and 14th place, respectively. Paris is the only Eurozone country featured in the top 10, and sees a drop of three places, which the report says may be due to falling confidence in the euro. Other European cities have seen increases in costs, pushing them up the rankings. London rose five points, bringing it into the top 10. Comparing regions within specific categories of costs, the EIU notes that Asian cities are the most expensive for grocery shopping, with Seoul in South Korea the priciest for food. European cities are the most expensive in terms of recreation and entertainment. At the other end of the ranking, India is home to many of the world’s cheapest cities. Bangalore is the second cheapest city, followed by Lusaka in Zambia, which has seen a drop of 22 places to become the cheapest city. Mumbai, Chennai and New Delhi all featured in the top 10 cheapest cities. Almaty, Algiers, Karachi, Damascus and Caracas make up the remaining top 10 spots. The survey discusses projections for going forward: “The cost of living is always changing and there are already indications of further changes that are set to take place during the coming year.” Crucially, they note, instability and conflict around the world could continue to drive inflation and affect the costs of living within certain cities. Emerging economies are likely to continue to see growth, becoming relatively more expensive. However the Chinese growth slowdown could “prompt a new wave of consumer caution”, driving down spending and undermining price inflation. Have you read? The 30 priciest cities in the world for expats Top 10 most expensive cities to rent property What is the cost of living around the world?